The Food Alphabet and More: AirAsia celebrates Mid-Autumn Promo fares from as low as P990 are up for grabs now! AirAsia celebrates Mid-Autumn Promo fares from as low as P990 are up for grabs now! AirAsia today formally opened its Mid-Autumn Food Festival celebration in Bonifacio High Street Central, Taguig City. The event highlights well-loved traditions, exotic Asian street food, and fun-filled activities until yesterday October 7th. But the celebration does not stop there! The Mid-Autumn Festival, also known as the moon festival, is celebrated by many communities around the world, like China, Taiwan, Hong Kong, Macau, Korea, and Vietnam. The two-day food festival was open to the public from 10:00AM to 10:00PM and is organized by AirAsia, the World’s Best Low Cost Carrier for nine consecutive years running, in partnership with BIG Loyalty, AirAsia’s Freedom Flyer Programme - Easier, Faster, Better, Further. Guests enjoyed treats such as mooncakes, assorted delicacies, and street food fare from different Asian countries there were also performances by a K-Pop boy band and entertaining presentation by AirAsia cabin crew. 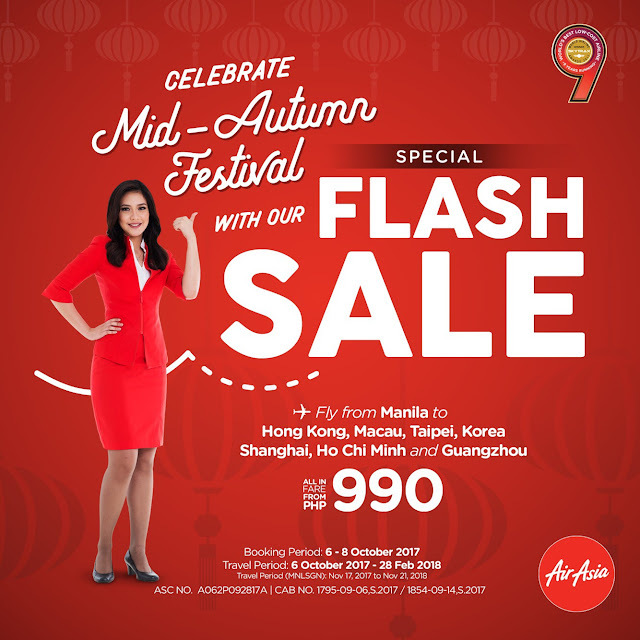 Aside from AirAsia Flash Sale where promo seats to China, Taiwan, Hong Kong, Macau, Korea, and Vietnam are up for grabs from as low as P990 and now available for booking via the airline’s mobile app, online at airasia.com. AirAsia also gave away special gifts and flight tickets to lucky visitors and social media contest winners during the event. AirAsia offers several direct flights from Manila to Taipei, Shanghai, Guangzhou, Ho Chi Minh City (Vietnam), Korea, Macau, and Hong Kong including flights from Cebu to Korea, Taipei and Singapore. Find out more about #AirAsiaMidAutumn and the #MidAutumnFoodFest by following @AirAsiaFilipino on twitter and @AirAsia on Facebook.